After coming to the end of a particularly stressful school year, I've been thankful to have the pleasure of a free Tuesday now my workload has slowed with the summer holidays. Not one for twiddling my thumbs, on this particularly grey Tuesday I decided to visit my beloved Bowes Museum (for about the millionth time this year if you were keeping score!) to revisit 'Shoes: Pleasure and Pain' and to while away some hours exploring one of my favourite haunts. Having spoken to the lovely Alison Nicholson (Digital Communications and Fundraising Officer) across social media, it also seemed like a good opportunity to catch up with her face to face over coffee and have a chat about all things Bowes, exhibitions and potential blog post ideas. When she suggested I consider writing about the 'English Rose: Feminine Beauty' exhibition, currently running alongside shoes, I must admit I was a little overwhelmed; what could a self-confessed fashion addict possibly have to say about these amazing women? Never one to back down from a challenge though, I remembered my geek-like obsession with the life of Yves Saint Laurent when writing about 'Style is Eternal' and left the cafe eager to see how I could put a fashion spin on portraiture. It was only when I left the gallery that my new obsession began. I was initially going to write about the fashions of the various sitters from the portraits in the gallery. Often described by my nearest and dearest as a 'proper English Rose' (which should read 'Kayleigh you always look deathly pale so we're being polite'), I felt an instant bond with the ladies staring back at me. 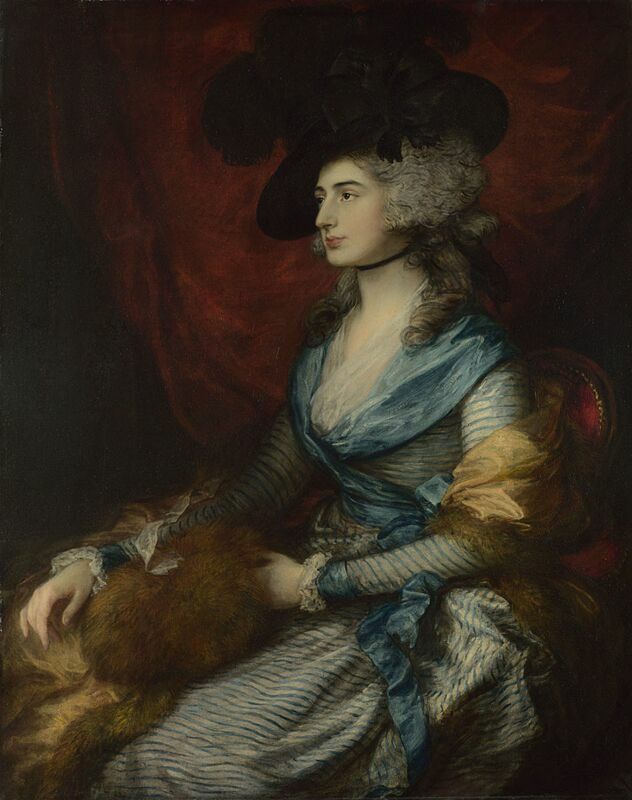 At first I honed in on 'Mrs Siddons' captured beautifully by Thomas Gainsborough in 1785. Sarah Siddons was an actress best known for her wonderful portrayal of Lady Macbeth. I've since discovered that her main gift as an actress was her ability to feel and portray emotion; so much so that the audience once believed her to be dead due to the agony she felt after watching her on-stage husband strangled before her very eyes, in her role as Aphasia in 'Tamburlaine'. At first, I was taken aback by her beautiful clothing, typical of the 1700s for someone of her stature. She was a well-known, well-paid actress so whilst her background may not have been regal, her wealth and status allowed her to enjoy the finer things in life, hence the fur in the portrait. But on reading about her, her style seemed irrelevant against her obvious talent. I started to feel this way about a few of the women I'd initially planned to write about. Was I doing them a disservice by merely talking about their clothes? My mind was made up when I discovered Lady Emma Hamilton. I don't know what drew me to her portrait; perhaps it was her pose and posture or her expressive face. However, much like the men in her life but with a completely different objective, I became consumed with finding out as much as I could about this lady. 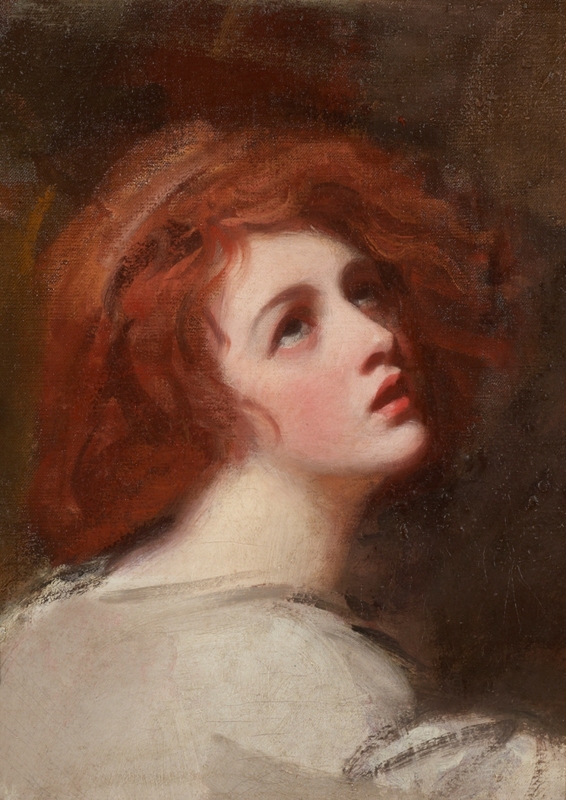 She was George Romney's muse and he became obsessed with her; painting her over a hundred times. Surely it takes an amazing woman for someone to be so enamoured by her that he would paint her that many times out of choice? Well, amazing she was, but possibly not for the reasons you would expect. On delving deeply into the internet, I found out a lot about Emma. She started off life as Amy Lyon and not much is known about her early years. She was either an actresses' maid or according to Wikipedia a 'model and dancer at the Temple of Health' working under James Graham, a Scottish quack doctor. She was keen to rid herself of her humble beginnings so changed her name to Emma Hart. Striking me as someone who was keen to get on in the world, she used her femininity, charm and sexual allure to better herself-eventually becoming Lady Hamilton; but her social assent is possibly her most interesting characteristic. Much like the gossip columns of today, I devoured her scandal like a sumptuous piece of chocolate cake! An unwanted child with Sir Harry Fetherstonehaugh who abandoned her, a relationship with Hon. Charles Greville at 16, then sent by him to Naples when he wanted rid of her so he could marry, a relationship with Greville's cousin Sir William Hamilton whom she then went on to marry, an open relationship with both Hamilton and Lord Nelson and a life ended crippled with debt due to a gambling addiction-its fair to say that Lady Hamilton's past was particularly chequered. But in spite of all of that, she was a woman that people idolised for both her style and stature. Whilst working with Romney, she began her 'Attitudes' her mimed sketches where she could simply take a single piece of fabric and transform herself into any number of characters, through use of her expressive face and natural ability to pose and apply her body language appropriately. She took inspiration from the loose-fitting tunics worn by the people of Naples, combined with her knowledge of Greco-Roman mythology to manipulate her poses and emulate characters and as a result, created a want for an effortlessly cool draped Grecian style of dress across Europe. Her style was adored and her beauty is tangible through Romney's portrayal of her. Celebrity is everywhere these days-and celebrity gossip consumes our lives as a nation. Little did I ever think I'd find so much of it in a portrait gallery. The women portrayed in 'English Rose' aren't simply faces on a canvas. They are strong, powerful, adventurous, promiscuous and most important of all, interesting. These portraits are merely snapshots in time of women I'd certainly like to meet-they may look perfect, natural and beautiful, but scratch the surface and you'll be sure to find scandal, empowerment and strength. If you are visiting The Bowes Museum soon, I urge you to visit English Rose; with a little bit of background research, who knows what you may find! English Rose: Feminine Beauty runs until September 25th, 2016 (here) and can be viewed as part of your general admission to The Bowes Museum. Many thanks to Alison for providing me with a copy of the exhibition catalogue as a starting point for my research and for the images. All opinions are my own (but I'll list the sites I used to aid my research below just in case you want to find out more! ), Lady Hamilton's life really got me hooked! What an amazing post! I'm quite guilty of not paying much attention to art, you forget that every piece has a story!